Fresh eggs from the farm, three different cooking methods, and some seriously tasty toppings. Eggs are such a wonderful food. I eat about 2 a day, every day. For some reason, I like them for lunch instead of breakfast (I tend to be in the mood for something sweet for breakfast whether it be these Lemon Ricotta Pancakes or these healthy Oats with Homemade Chocolate Hazelnut Butter). 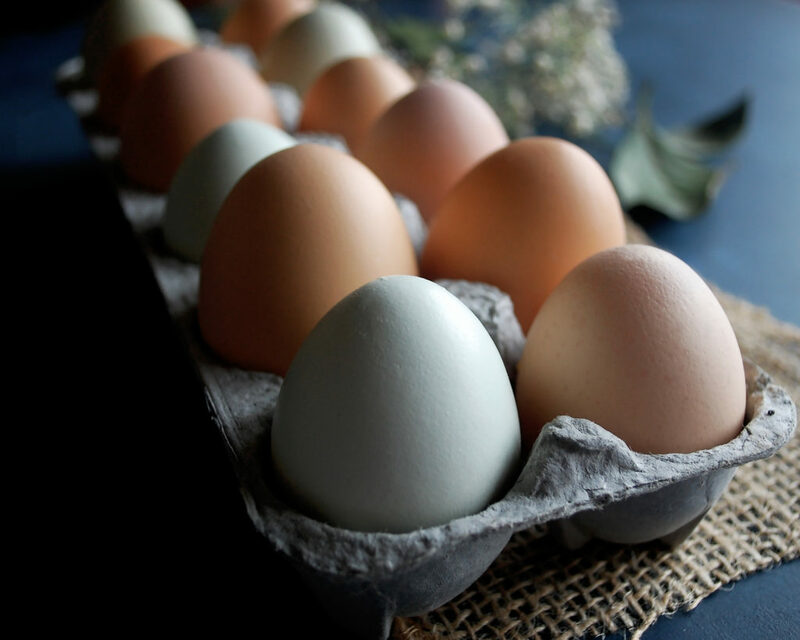 I think most people are similar in that eggs are a part of their regular routine. I’ve got three different techniques/flavor combinations to share with you because eggs are so versatile that you might as well learn multiple ways to cook them. And since today is Easter (Happy Easter to everyone! 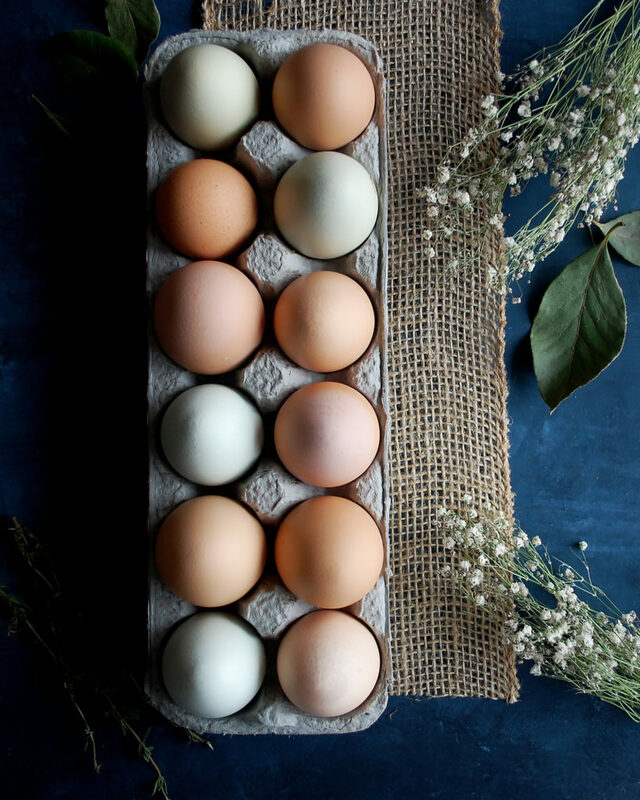 ), hopefully some of the techniques will inspire you to serve up some eggs in addition to the traditional colored hard-boiled ones, because of course those will always be on our Easter table! Plus loads of brunch food, lots of desserts, and a huge baked honey ham. I’ve added some additional dishes to our typical Easter feast, like these Deviled Egg Gravlax Tartines and this unbelievably good Coconut Carrot Praline Cake with Cream Cheese Frosting. Anyways, back to the techniques. I’m talking about 3 specific cooking methods: scrambled, fried, and poached. 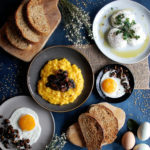 Following this method with result in soft, fluffy eggs with a creamy texture and beautiful flavor because of the low heat and constant agitation. 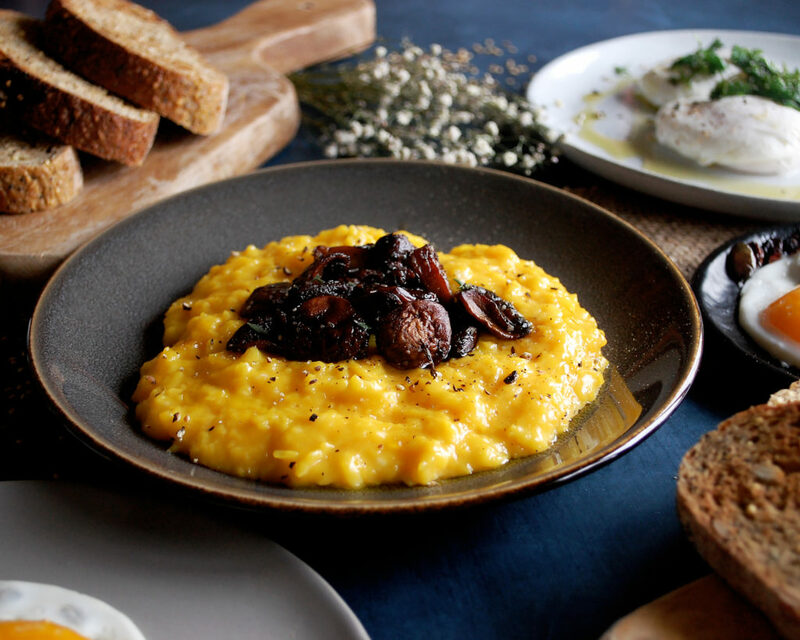 The worst is when scrambled eggs have a tough texture with those dry, brown edges. Or, if they have those sticky, paper-like edges from being stuck to the pan. We’ve all been there, especially when in a rush. Scrambled eggs are sometimes my go-to meal when I have no time to cook, so I just rush the technique and eat them however they come out. 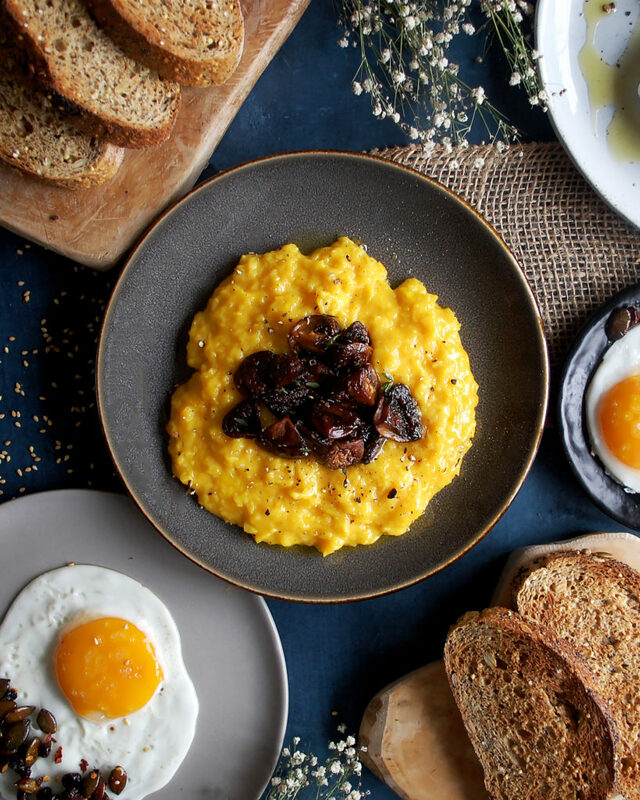 But, when done properly, scrambled eggs can be quite the treat. I like to add some sort of topping to the eggs whether it be roasted vegetables or fresh herbs. Here I’ve cooked some beautiful mushrooms down with thyme and garlic, finished them with a little butter, and serve them right on top of the eggs. This technique is simple, but you do have to make sure you keep an eye on a few key factors. Keeping the temperature controlled, having enough oil in the pan, and making sure to pull the egg before it overcooks…these things will set you up for a successful fried egg. If the heat is too low, the egg will stick. If it’s too hot, the edges of the white will blister and brown. A properly fried egg should have tender, fully set egg whites that are completely white, not brown. I like the yolk runny, but they can also be cooked longer if desired. 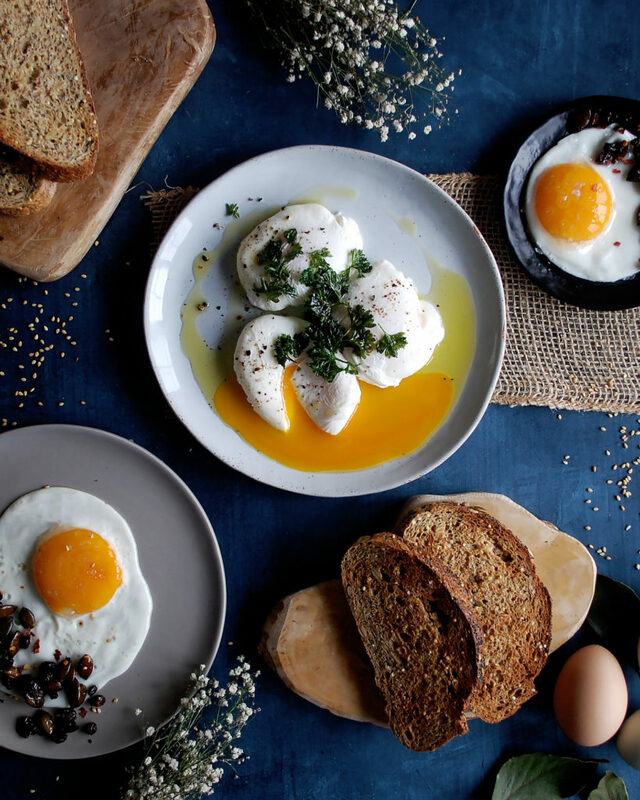 Fried eggs are so good on their own that all they really need is a drizzle of olive oil. However, sometimes I like to add some crunch. I’ve made a chili oil with pumpkin seeds and dried currants, which is the perfect topping. It’s flavorful and crunchy, without being too overpowering. 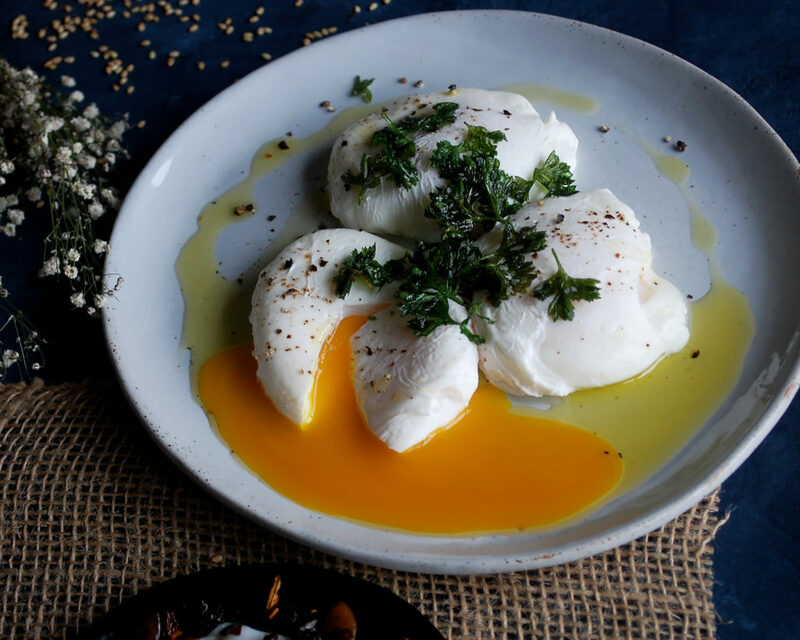 Properly poached eggs should have a fully coagulated egg white, and a warm yolk that is only partially set (still flowing). Poached eggs are probably my favorite. There’s something about the texture that I absolutely love…soft, yet firm, and completely silky on the inside. I mean…the yolk! When you cut into it and the yolk oozes out, there’s nothing better. Just make sure to have a toasted piece of bread nearby to soak up all the drippings. I’ve kept these simple with some crispy parsley, a simple touch that adds an extra herby flavor. 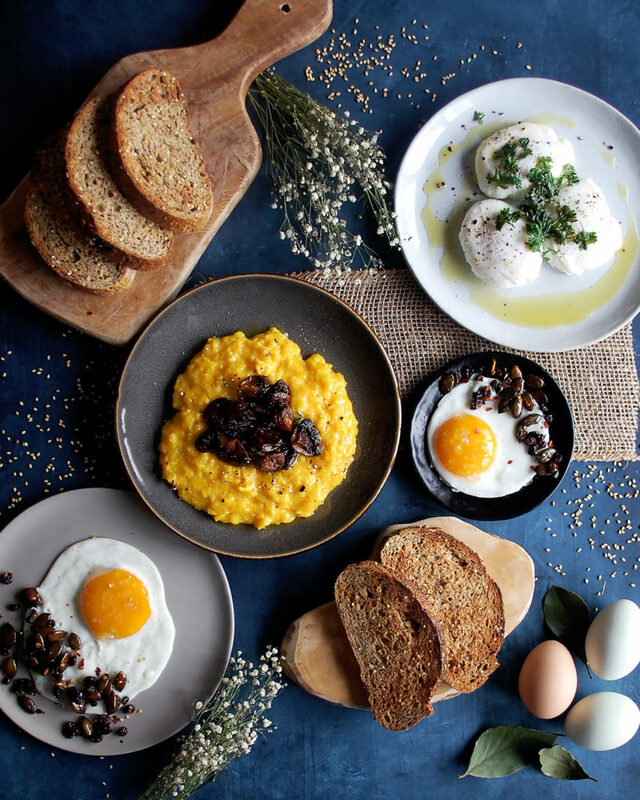 There are so many ways to cook and use eggs, and I hope these 3 simple techniques and flavor combinations give you some inspiration to start experimenting yourself. Ps. I hope everyone has the most wonderful Easter Sunday! Enjoy the family, friends, and delicious food! For the mushrooms, heat a sauté pan over high heat. Coat the bottom with oil. When sizzling hot, add the mushrooms, garlic, and thyme. Cook until the mushrooms begin to brown. Lower the heat to finish cooking. Add the butter and let melt. Season with salt and pepper. Remove the thyme sprigs before serving. For the scrambled eggs, whisk the eggs in a mixing bowl. Add the milk. Season with salt and black pepper. Heat a sauté pan over medium heat. Add the butter. Pour in the eggs and drop the heat to low. Stir the eggs as they cook. Remove the eggs from the pan when they are soft and creamy. Keep warm. For the spiced pumpkin seeds, heat the olive oil in a small sauté pan over medium low heat. Add the pumpkin seeds, currants, and red pepper flakes. Let cook for a few minutes until the seeds are toasted and the currants have plumped up. For the fried eggs, heat a non-stick pan over medium-low heat. Add enough oil to coat the pan. Break each egg into an individual dish. Fry the eggs one by one (or use multiple pans). Pour each egg into the hot oil. Cook until the whites are set and the yolk has reached your desired doneness. Slide the egg onto a plate, season, and keep warm. Coat the bottom of a small sauté pan with a ¼ inch of oil. Heat over medium low heat. When hot, add the parsley and let fry for a minute or two until crispy. Use a slotted spoon to transfer the parsley to a paper towel. Season with salt when hot. For the poached eggs, fill a pot with 5-6 inches of water and bring to a simmer. Add the vinegar and salt to the water. Break each egg into an individual dish. Gently pour the eggs, one by one, into the poaching liquid. 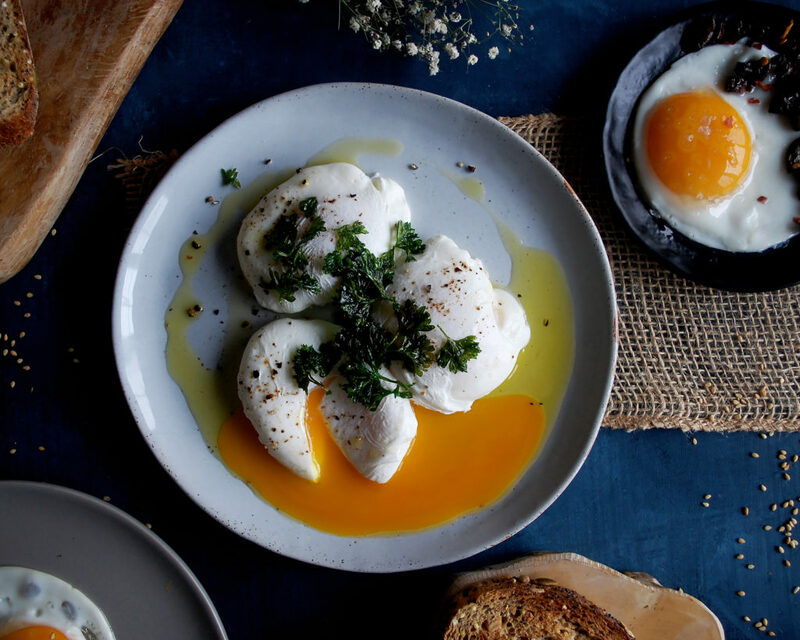 Poach for 3-4 minutes (or longer if you want the yolk to firm up more). Use a slotted spoon to transfer the eggs to a paper towel. Trim the whites and season. Keep warm. I always serve eggs with lots of toasted bread!